The voodoo lily is really stretching out this bloom business. It's gotten taller and the buds are finally starting to open. I do love unusual plants for the garden. There is quite a few plants that give off foul smells to attract flies for pollination. 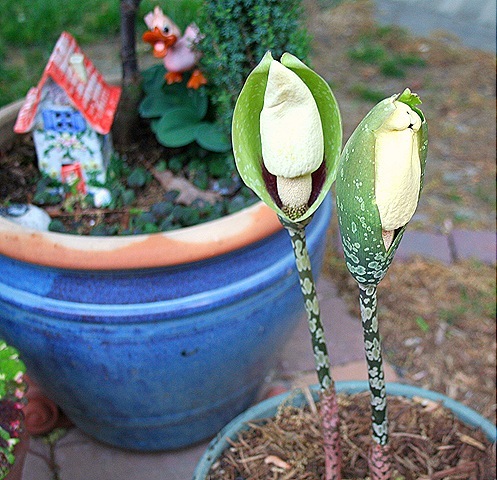 Every heard of the "corpse lily"? Here is a great webpage about "stinking flowers". Voodoo Lily? I’ve never heard of this one. Is it fragrant? I HAVE heard of the Corpse Lily and it’s does smell like something dead. How could any plant have such an awful smell…, and why? Love the purse. You do such nice work.